Precise astrometry and additional spectroscopy are required. Improved astrometry (1" accuracy) by Daniel Bamberger using three CCD images taken by Róbert Fidrich (instrument: T13 at the iTelescope network): RA 11h26m15.16s, DEC -65°31'23.3" (J2000.0). A Gaia DR1 source (G= 18.02 mag) is located 1.3" from this position. My confirmation image made using the T13 telscope at the Siding Spring station of iTelescope.net mentioned befor by Patrick. High resolution version can be downloaded here. I imaged the new star but my chosen exposure got me overexposed images. I will try agin tonight with reduced exposure times. The star is very bright close to mag 6.5 in V (JD 2458133.88865) and mag 7.1 in B.
Btw isn't AAVSO planning to issue an Alert Notice? Yes, an AAVSO Alert Notice on the nova will be issued today. I was able to get a BSM_S BVRI set from last night. Nova is B=7.10, V=6.60 as of 2458134.01. It is nearly saturated on my V images, so consider these lower limits to its current brightness. Thanks very much, Arne. I'll include them in the Alert Notice. When you have a chance, could you please submit them to the AID? Thanks. I was considering taking DSLR images also this week if the weather coperates and submitting tri-color (GBR) observations, if worthwhile. 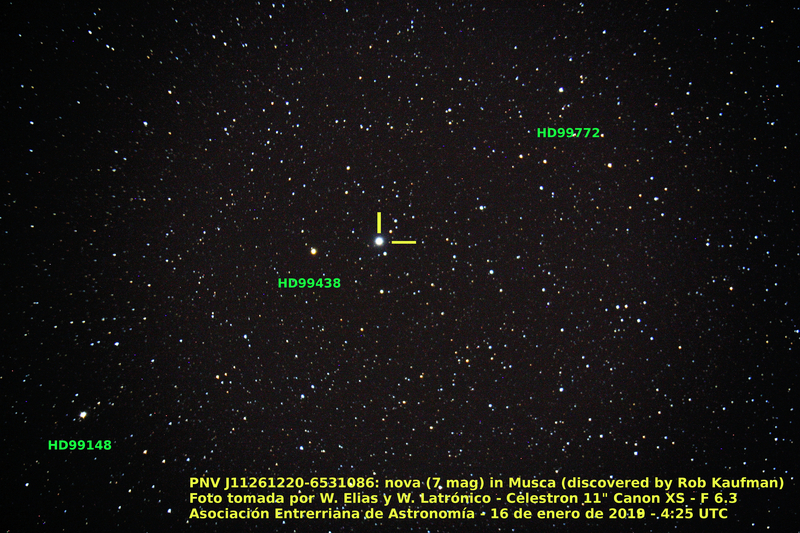 AAVSO Alert Notice 609 announces and reports on Nova Muscae 2018 = PNV J11261220-6531086. Please see the notice for details and observing instructions. 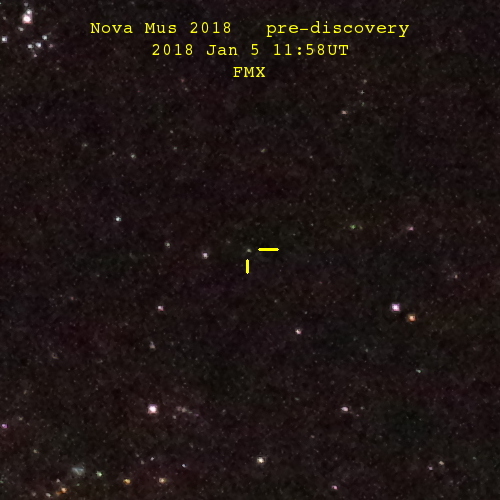 While experimenting with various camera/lens/focus settings for a southern Milky Way panorama on the evening of January 5, I unknowingly recorded Nova Mus 2018 pre-discovery. The uploaded image is a crop from the unprocessed original jpg. 10 seconds @ISO12800, 70mm(edited) lens on a Pentax K30. Unfortunately I didn't save any raw images (or deliberately de-focus this one) so there's little hope of deriving a precise magnitude. Looks to be about mag 6 and a half on this image? I send a photo link taken with Celestron CPC 1100 and Canon Rebel XS camera with F / 6.3 focal reducer. 2-minute exposure, ISO 800. 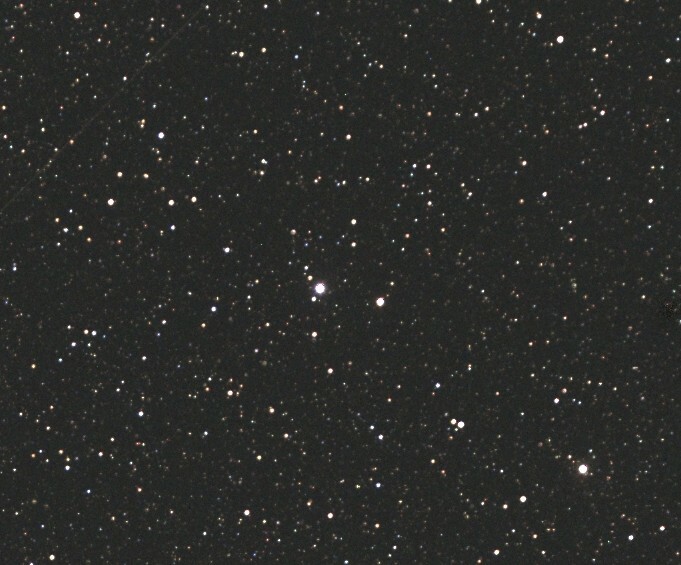 The nova is still bright, I made it at V= 6.7 tonight. Be aware that the original sequence had two comparison stars (64 and 71) added yesterday night to account for the current brightness. Also plotting a Binocular chart is a good idea at this stage. The first peak seen in ASAS-SN at V= 8.8 is outside of the survey range so that magnitude is saturated. Anyway, this seems to be that kind of nova with multiple peaks. I have uploaded new observations this time no saturation in V (mag 6.5) and B (mag ~7). Uncertainties are 0.03 and 0.05, respectively. I use comp stars which are much dimmer (around mag 11). Will check if I can use other brighter comps in my field (45x45 arcmin^2).